It can be said that 2016 will witness more beef among the artists than hit songs. With recent twitter fight started by Hypertek act, Dammy Krane firing shot at the Starboy CEO, Wizkid over accusation that the latter has been constantly stealing his ideas. 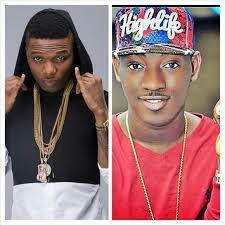 #ENTERKRANER (@dammy_krane” Wizkid ignored the accusations and instead announced plans of starting his world tour. Fastforward to 24 hours later, the duo met at the Obafemi Martins birthday star studded party at the Quilox club in Victoria Island, but at this time it was no longer twitter rants, it went physical and took the effort of their colleagues to disengage them. The management of the club headed by Shina Peller took to his twitter page to apologize to the customers. As at the time of filing this report, we learnt that Quilox boss, Shina Peller has reconciled both Wizkid and Dammy Krane.